This past weekend I attended a sneak peek event at CatCafé Lounge, which is the first nonprofit cat café in Los Angeles! I had a fantastic time and think that the lounge is a great place for adoptable kitties to hang out while they wait for their forever homes. Located on the second floor of the building, paw prints lead visitors and potential adopters up the stairs. You enter the café portion of the building, make your entry donation (remember, nonprofit! ), get a free coffee or tea and can also order a baked good or snack if you want to. Then, you’re ushered into the separate lounge area and greeted by the cats! Kristi Labrenz Galvan, Founder and Executive Director of CatCafé Lounge, began her journey of opening the nonprofit cat café back in 2015. I asked Kristi why being a nonprofit was important to her when many cat cafés are not. The mission of CatCafé Lounge is to increase adoptions & reduce euthanizations while socializing cats. 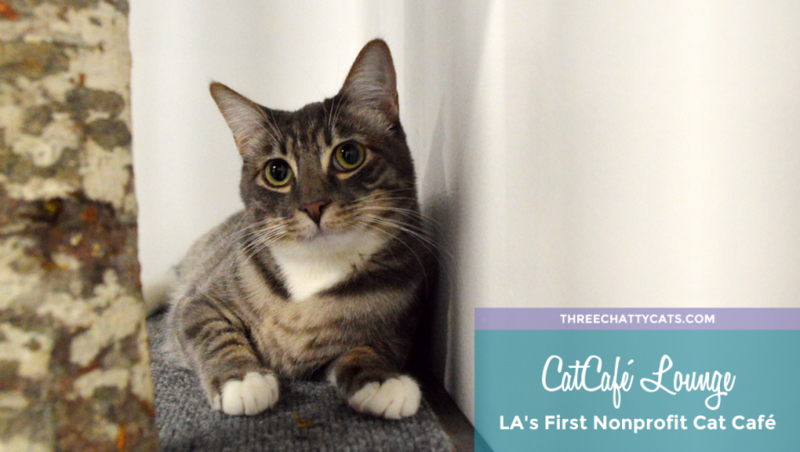 And because of that mission, CatCafé Lounge is an NKLA Coalition Partner. When I visited on Saturday, the cats were friendly and playful. But if they wanted a break from the visitors, they had a separate room to head to for some time out. There are also plenty of areas in the main lounge that are high up so they can monitor the goings-on from a distance. CatCafé Lounge opens to the general public on February 3, 2018 and their reservation system is now open. 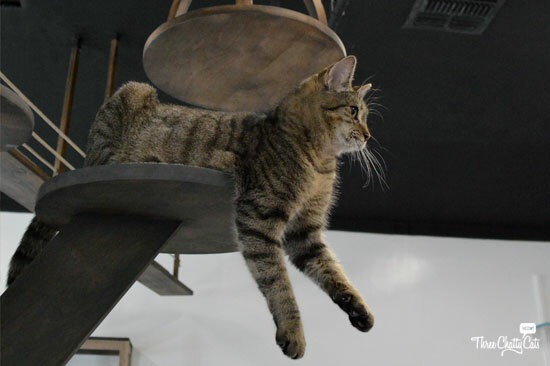 Feline aficionados (and those looking to adopt) in the Southern California area should definitely check out CatCafé Lounge! 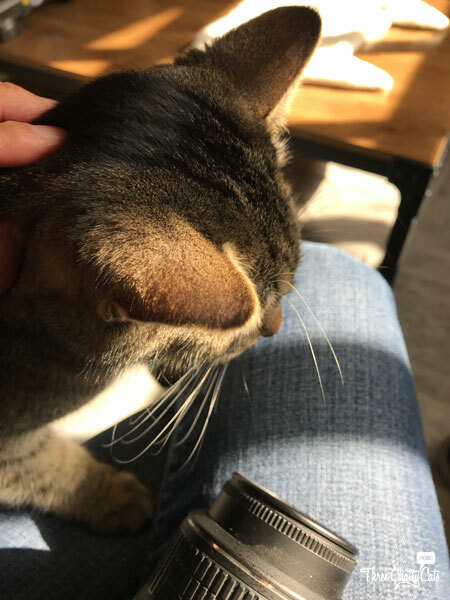 I had a wonderful time at the preview event and know that any cat lover would be happy to visit the cat café! As their motto states… Sip.Socialize.Adopt. This cat found the sunpuddle on my lap. Previous Meet the Fosters LA! A very special place! Thank you so much for sharing! Love, love, love that place! I’ve only been to one cat cafe in NYC before however love the clean contemporary design of this one. I also really like that this one is a non profit and focusing more on the cats welfare than profits. Kuddos. What a great initiative. I love that the cafe is a non-profit. 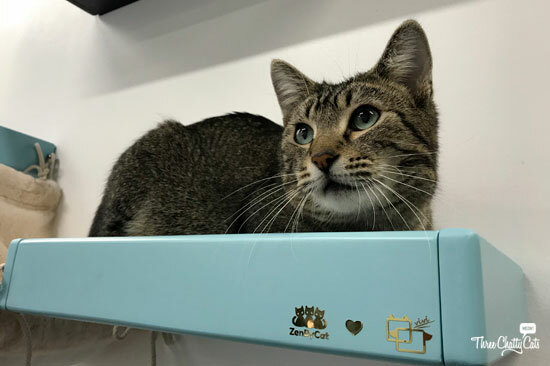 Cat cafes are becoming increasingly popular, and knowing that the money goes back to helping cats in need definitely makes it stand out among the rest. I bet these cats love being at the cafe, and it’s so great that they are simultaneously being socialized and prepared for their forever homes. Ottawa now has one … and I’ve seen a hedgehog cafe too! I like these places that switch up how animals can be adopted. It’s less clinical. More relaxed for everyone – pet and people. Some cat wanted to come home with you! I’m glad every town is now opening cat cafes and I hope more will become nonprofit. I love that they are focused on the undercat! Yay! 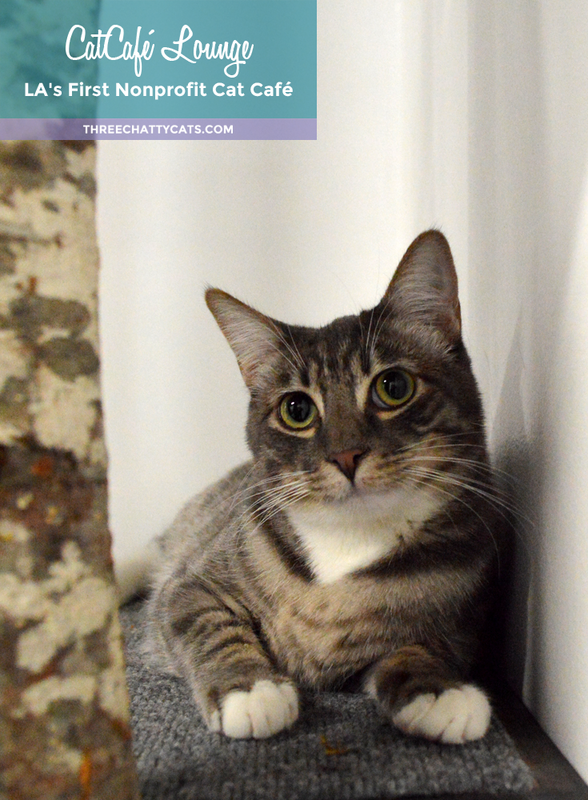 I’ve now visited several Cat Cafe establishments, in New York and Dallas and elsewhere. I love the trend of showcasing adoptable cats in unique ways, and the great partnerships that develop for the benefit of all. A really grand idea whose time has come. Purrs of success! Thanks so much for the support when Mr Buttons had to go over the Bridge. It was very sudden and he was a big part of our family. We miss him terribly as do so many as he was our official greeter. He never met a stranger only new friends. This is a FABulous Post and I adore the idea of a non-prifit cat cafe! How wonderful is that. I adore the pictures too. Our local cat cafe Neko-Ngeru is not a non profit but they make no money from the adoption of the cats they host and it s, like this cafe, a real asset to its community. A cat adoption cafe allows people to ‘walk and chew gum’ at the same time. Coffee and cats what’s NOT to love!! How wonderful! 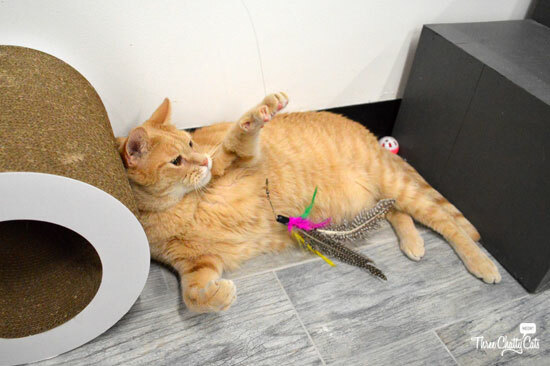 I hope that lots of cats find their forever home because of their time at the cat cafe. What a great way to get people to consider adopting a cat. The fact that it is nonprofit makes it that much sweeter. That is a wonderful place! I wish we had cat cafes in my area. What a cool place! 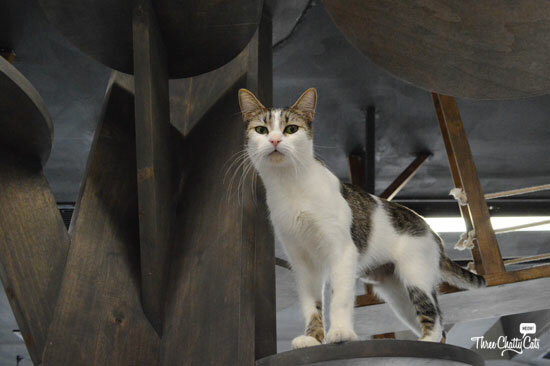 We love how cat cafes are popping up all over. It’s a great way to showcase adoptable cats. What a fabulous place!!! Oh how I want to visit a cat cafe one day! Wonderful!! we just got one in my hometown – i love going there and hanging out! Sounds amazing! I’ll have to check it out!!! That looks like an amazing place. Such a lovely idea! That ADOPT board looks fantastic. Nicely designed. I keep reading more and more about cat cafes opening, so I’m holding out hope that one may come to Tucson. We have dogs, who I love dearly, but when I visit my sister, I love playing with and petting her cat. 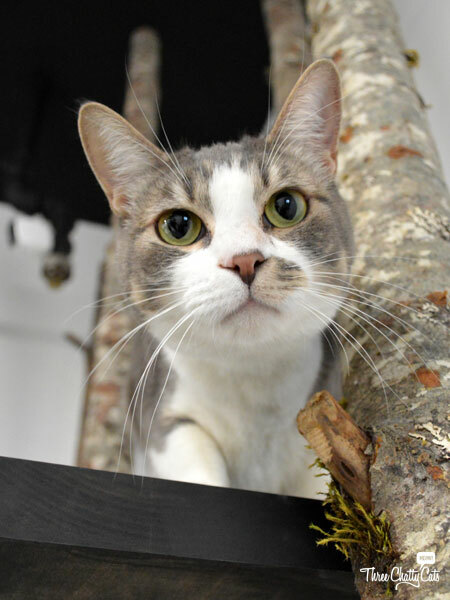 Helping socialize adoptable catfaces would be so rewarding. How cool are those cat trees! Love the unique designs. And it’s a great idea to be a non profit – just imagine how awesome this will be to help prevent cats from being euthanized. This looks like a wonderful place. Mom Paula visited a Cat Cafe in New York last year. We have a new one about 8 miles from us but Mom Paula hasn’t visited it yet. This looks like a wonderful place. My dogs won’t allow me to have cats, but I could get my full of cats here! What a great way to show people how awesome these cats are, raise some money, and have a fun afternoon! Hiya Chatty Cats, what a great post and a great idea! We loved the photos, just gorgeous and so inspiring! I love that more cat cafes are opening and appreciate organizations like this, where money spent at the cat café will go 100% back to their incredible mission of saving lives! Everyone looks so happy. The ADOPT wall is a great idea. Such a beautiful idea and that too for non profit! We do have a cat cafe here in San Francisco too, I have to check it out! I love the idea of cat cafes. Everyone wins. People get their cat fixes. Cats get socialized. Both cats and humans find each other, and cats find homes. I visited the one in NYC when it first opened. You know what I would love? A story about how they’re all designed. Most of them have really cool catified spaces, and I would love to see what each of them has done. This Cat Cafe sounds like the cat’s pj’s. I have been to the London Cat Cafe but the cats were not adoptable. LA has the right idea for adoption of kitties. I think what is needed is more communication between cat cafes. I’m so jealous! Then again, the last time I went to “just look and give love” to shelter cats, I came home with Ellie. Didn’t see that one coming. You photographed so many sweethearts!